Gear tooth lead variation caused by wobble. In this issue we will consider the problem shown in the following gear tooth lead inspection chart (Figure 1). This chart is a measurement along both the left and right flanks of four teeth of a gear. This is an AGMA-standard gear check per the ANSI/AGMA 2015-1-A01 standard. In particular, this is a measurement of the “total helix deviation,” denoted as Fβ, and defined as the “distance between two design helix lines which enclose the actual helix trace over the evaluation range.” In simple words, Fβ is the difference in distance between the measured high and low points. This value is absolute, so viewing the chart is necessary to determine the location of these high and low points. A perfect gear would give a perfectly vertical measurement line (these charts may also be depicted horizontally). By combining the chart and the absolute value of variation, we have both an understanding of the type and magnitude of error to be considered. 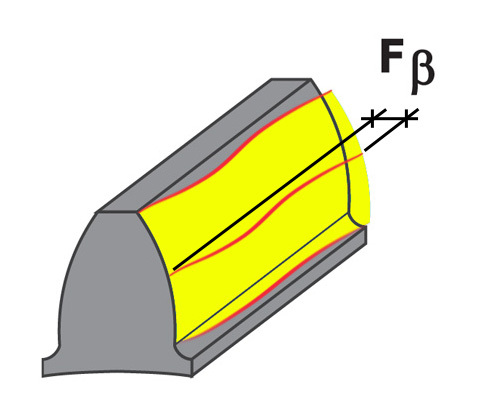 Part blank: Check for parallel faces and perpendicular bore. Fixture: Check for proper alignment and/or runout of the fixture face. Machine: Check for misaligned tailstock, a worn or damaged tailstock center, or runout of the work spindle. Inspection: Check for runout in the arbor or fixture, or a misaligned tailstock.